We all love Mexican food, right? But, sometimes we get bored with the usual tacos and enchiladas. This recipe is sure to spice things up. We’re taking the traditional Mexican ingredients and turning them into a super-fun creation! This Chicken Tortilla Pie is layers of hearty corn tortillas, tender chicken, spicy salsa and ooey-gooey cheese baked to perfection. Now that is my kind of pie! Preheat oven to 450F. Coat pie pan with cooking spray. Spread half refried black beans over each tortilla. Lay 3 tortillas in pie pan and top with half of the chicken, salsa and cheese. 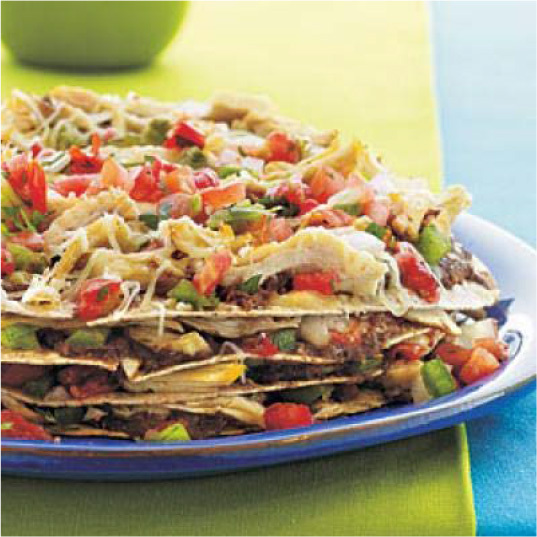 Stack the next 3 tortillas on and layer with remaining chicken, salsa and cheese. Bake for 10-20 minutes or until thoroughly heated and cheese melts. Cut pie into 4 wedges. Serve with Greek yogurt and other toppings, if desired.